Extreme power, exceptionally long battery life… this one is likely to draw a lot of attention! 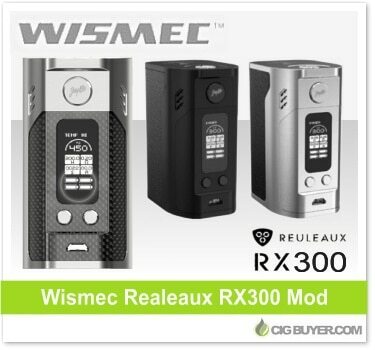 The highly popular Reuleaux series has been upgraded with the brand new Wismec Reuleaux RX300 Mod. The RX200 was one of the first triple 18650 mods to hit the market, but the RX300 houses FOUR BATTERIES and offers up to 300W OF OUTPUT power… WOW! It has the same great aesthetics as the RX200 with large OLED screen, advanced temperature control, preheat, dual circuit protection, flip open battery cover and more. Plus, it’s firmware upgradeable.